​​​​ SAN ANTONIO – H-E-B plans to build a massive distribution and manufacturing plant on an 871-acre East Side plot the company bought fall 2018. The 1 million-sf warehouse will employ 600 workers when it comes online in 2020, 300 of which will be new positions. H-E-B plans to invest at least $130 million at the site located at the southwest corner of East Houston St. and South Foster Rd. over a three-year period. 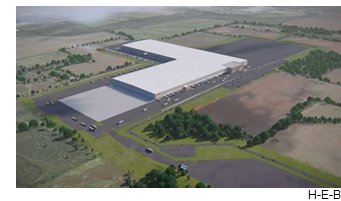 Eventually, the company plans to develop a master-planned campus that encompasses manufacturing and warehouse facilities and transportation. ​Check out San Antonio-New Braunfels Industrial Market Research​​.